Where is your next property venture? Whether your investment is on the East Coast, in America’s Heartland, or out West, environmental factors are a concern. With this in mind, it’s essential for any project manager to maintain two key objectives: minimize environmental risk and maximize investment. To achieve these goals, it is crucial to partner with nationwide environmental services. Professionals who specialize in nationwide environmental services can solve your environmental compliance objectives seamlessly and quickly – wherever you decide to invest. The environmental firm will offer the following services to protect you and your project and guide your efforts to a successful outcome. Regulations and permitting requirements vary by region. A consulting firm that offers nationwide environmental services offers the experience and knowledge to help you navigate the permit application process in your area. They will determine what, if any, environmental permits are necessary to proceed. The firm provides the expertise required to complete all necessary steps to successfully launch your project and maintain compliance throughout completion. The prevalence of asbestos varies by region, but it remains a concern nationwide. Many projects throughout the country require asbestos evaluations and abatement. A nationwide environmental service offers specialized professionals to deliver these services. Their thorough, professional reporting will ensure your project aligns with EPA regulations and best practices. Value-driven waste management solutions allow a company to transform cost-draining waste streams into revenue streams. A nationwide environmental service offers the expertise needed to provide these solutions. They can reduce your disposal costs and help you develop new sources of revenue. The firm will also ensure your company meets local regulatory requirements regarding waste. Of course, it’s not enough for a firm to offer these nationwide environmental services. To deliver value, they must offer quality services. The following three characteristics are key. A quality firm provides detailed assessments and reporting. Phase I and Phase II ESAs should include thorough research of the property’s historical information. This should encompass personal interviews, on-site reconnaissance, a review of past and current issues, and consideration of adjacent properties. When you launch your endeavor, it’s difficult to know precisely what nationwide environmental services you will need. A quality firm is proficient in all areas of environmental concerns so they can provide seamless services regardless of what course your project takes. These comprehensive services will create a streamlined process that allows you to address all areas efficiently and cost-effectively. Firms who offer nationwide environmental services should be able to demonstrate a track record of success. Their proven testing and submission methods should result in a high project approval rate. Partner with a firm that you can trust to get the results you need. 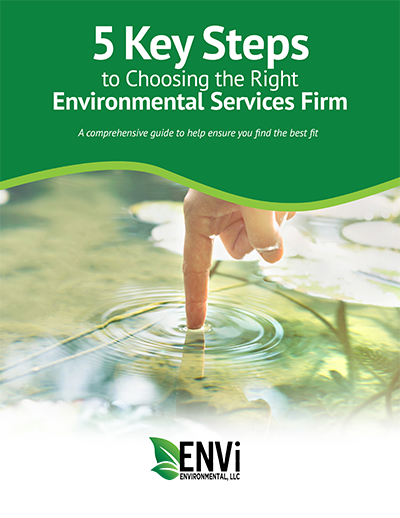 With more than 30 years of experience, ENVi Environmental is your go-to source for nationwide environmental services. ENVi Seamless: Our suite of services includes all environmentally-related offerings, from evaluation and assessment to abatement or remediation. Our ENVi 360™ Solution covers the full spectrum of services to meet the needs of complex projects from start to finish. Comprehensive assessments: ENVi Environmental prepares detailed and comprehensive assessments that are compliant with the ASTM 1527-13 as standard practice. Industry experts: ENVi Environmental personnel include professionals who are certified and specialize in erosion, sediment, soil, hazardous waste, asbestos, and OSHA training. High approval rates: ENVi Environmental provides consistent, detailed methods that result in a high approval rate for the projects we submit to regulatory agencies. Our extensive experience working with regulatory agencies and our in-depth understanding of industry standards have resulted in a near-perfect record of successful approvals. Contact our team today to find out more about our nationwide environmental services and how they can benefit your business. by partnering with the professionals at ENVi Environmental.